Yet another hit for BIS. This is Volume 12 in an on-going series of the complete Cantatas of J.S. Bach by this Japanese ensemble. It is indeed excellent. We have here a Swedish company, employing a Japanese choir, orchestra, soprano and conductor, English counter-tenor, German tenor and Dutch bass. It has often been said that music is international, and this issue confirms it in full. Bach, by these artists, is no longer the curiosity it was when BIS issued Volume 1 back in 1995. It must have been the same act of faith for BIS as it was for Chandos with the issue of Tchaikovsky's 5th Symphony by the Oslo Philharmonic with Mariss Jansons. Both series have received critical acclaim, as they should have, given the stunning levels of performance and recording that both series have achieved. I am very happy to confirm that the features of the first and subsequent issues has been maintained. These include very clear, atmospheric recordings displaying the qualities of Masaaki Suzuki and his colleagues. Secure playing and singing, immaculate intonation, constant attention to maintaining interest through Bach's many changes in mood and fine solo and choral singing are all hallmarks of the series. They are all accompanied superbly by a period orchestra who have absorbed the features of period playing without the disadvantages, still occasionally heard with other groups. A very comprehensive and well presented booklet is supplied. Cantata No. 147 - This is a very popular cantata, having as one of its chorales the well known Werde munter, mein Gemuthe, or in English - Jesu, Joy of Man's Desiring. Bach completed this Cantata in 1716, when he was 31. It was intended for the Sunday before Xmas. When he moved to St. Thomas's, Leipzig in 1723, further movements were added and the performance of this cantata moved to 2nd July, the Feast of the Visitation of the Virgin Mary. This change involved the addition of three recitatives and the chorale. There was no such problem with Cantata No. 21, written earlier when Bach was 28, and performed at Weimar, Hamburg and Leipzig. There were changes however, and what we hear on this disc is the accepted final version, written to a text by Salomo Franck (as was also Cantata No. 147). It is a powerful work, in two parts, with 11 movements. Given the various nationalities and backgrounds of the various artists, this well integrated and wonderfully performed disc is a joy from start to finish. Bach is big in Japan, very big. 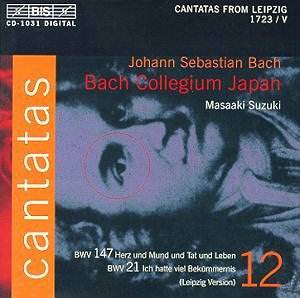 On the Swedish BIS label, the Bach Collegium Japan (hereafter BCJ) is recording a complete series of the Bach Church Cantatas, approximately 200 in all and this is Number 12 in that series. The BCJ was founded in 1990 with the aim of introducing period performances of the baroque period to Japan, with a clear emphasis on J.S.Bach. The Collegium is an integrated unit with its own chorus as well as orchestra, set up in 1990 by its founding father Masaaki Suzuki who is its current music director. Cantata No 147, " Herz und Mund und Tat und Leben" ("Heart and Mouth and Deed and Life"), the shorter of the two on the disc, has the customary two parts, each intended to frame a central section of the service with a musical content to match the sermon's theme. It was written in Weimar for use on the Sunday before Christmas, but because of different customs in different regions, after his move to Leipzig it became a setting for the July celebration of The Feast of the Visitation of the Blessed Virgin Mary. The opening chorus, with a prominent trumpet introduction, showed off the big acoustic and the technically excellent choir. I recall from an earlier disc a reference to slightly higher than normal pitch being used then and I assume the practice has continued here. The blend of two very distinctive voices in "Schame dich, o Seele, nicht" bringing together an oboe d'amore and a counter-tenor made an unusual but pleasing conjunction. In her solo "Bereite dir, Jesu" the long sustained note in "gläubende" soared away splendidly, and the tenor aria that opens Part Two showed off a light, fresh sounding voice. The commanding bass of Peter Kooij has admirably clear diction and an evenness throughout his full range. One of the best known of all Bach pieces "Jesu joy of man's desiring" is a chorale from this Cantata. Sung pleasantly enough but at a somewhat sluggish tempo it had a prominent slide trumpet (tromba da tirarsi) which made its presence felt (though not unpleasantly, I must add ). Whatever one's views may be on period performance and instruments, these different sounds do have an effect I often enjoy. The longer Cantata, No 21, "Ich hatte viel Bekummernis" ("There were many afflictions") is played and sung here in as it would have been in Leipsig on the third Sunday after Trinity. There are other, different versions of the Cantata that have been recorded by the BCJ on other CD's. It opens with a Sinfonia with a splendidly played oboe, an interweaving line from a solo violin and continuo. The forces are the same throughout both Cantatas with earlier comments generally applicable to which I will add an honourable mention for the clarity of the German diction of the all-Japanese Chorus. More excellent oboe playing features in the expressively sung soprano solo, and in the extended aria "Bache von gesalznen Zahren " the tenor voice handles the quick gear change at "Sturm und Wellen" easily enough. Part one ends with a contrapuntal section involving soloists and chorus that was clear and precise but a shade mannered. The bass & Soprano duet, with cello and organ support confirmed earlier views of the qualities of the bass voice. A qualified recommendation then for a 'safe' if uninspiring version of these two works. Throughout there is a feeling that parts are being played and sung with too much care, too much inhibition - with the exception of some fine individual instrumental playing - and a little more relaxation coming from greater confidence would help.